In 2004, an outbreak of MRSA decimated my college rugby team. Methicillin-resistant Staphylococcus aureus–also called MRSA (pronounced MER-sa)–sent every infected player to the hospital for treatment, every uniform and piece of equipment to the cleaners, and the rest of the season into a rut. In 2003, five players on the St. Louis Rams football team were infected with MRSA, too. We were just like the pros. 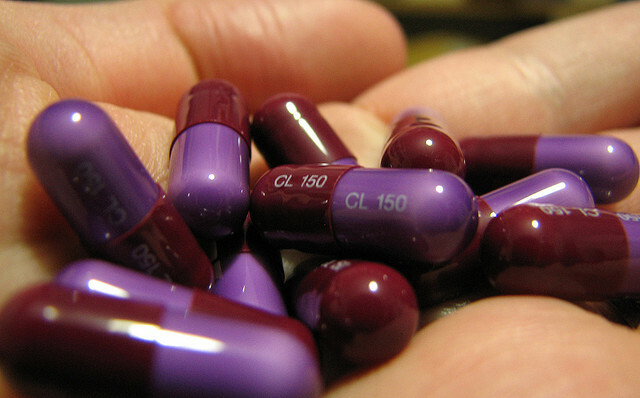 “Superbugs” are bacteria that have developed immunity to a wide array of antibiotics. Whether food-borne, hospital-acquired, or passed around the locker room, these bacteria can cause life-threatening infections. But how effectively are public health officials dealing with this growing wave of multi-drug resistant bacteria? Not as effectively as they ought to be. MRSA is the most common superbug found in U.S. hospitals. In 2007, the Centers for Disease Control and Prevention estimated that more than 94,000 invasive MRSA infections in the country were responsible for killing more than 18,000 people. Despite hospitals’ best efforts to disinfect their wards and implement rigorous hand-washing policies, hospital-acquired infections are increasingly difficult to treat. And MRSA is only one of a handful of superbugs. Other superbugs you may have missed include Clostridium difficile, Enterococcus, Klebsiella, Pseudomonas, and Acinetobacter. Although antibiotics have been around for two billion years or so, we’ve only been using them since the discovery of penicillin in 1928. Like penicillin–which is isolated from a fungus–most antimicrobial compounds are derived from substances that occur naturally. Different antibiotics target different components of a bacterium’s internal machinery, incapacitate them, and leave them to be cleared out by the immune system. The discovery of antibiotics was undeniably revolutionary to modern medicine. Doctors thought they finally had control over bacterial infections. No longer would a patient need to have a leg amputated for an infected foot wound. And pneumonia, dubbed “the captain of the men of death” by pioneering physician William Osler in 1892 for being “one of the most widespread and fatal of all acute diseases,” was finally treatable. But doctors got ahead of themselves. They began prescribing rounds of antibiotics for any old infection–including viral infections like the flu, which won’t respond to antibiotics designed to attack bacteria. And if an infection couldn’t be treated with one antibiotic, physicians would just turn to another antibiotic. The more antibiotics you use, the more pressure there is on bacteria to develop resistance. In fact, some strains of MRSA are now also resistant to vancomycin, a separate class of antibiotic altogether. Here’s how it works: every time an antibiotic is administered, the pressure on bacteria to evolve resistance increases. That’s because the antibiotic will kill all those bacteria susceptible to it, leaving only the ones with built-in resistance to that antibiotic. Over generations, these resistant survivors are the only bacteria left to pass on their genetic material (or transfer it to other bacteria in little packets known as plasmids). Voilà, you’ve engineered an antibiotic-resistant strain of bacteria with what you thought was a wonderful antibiotic drug. Bacteria have evolved this way over millennia. The only difference today is that we’re selecting for resistance at an increased rate. We’re down to a few classes of antibiotics for a growing number of superbugs surfacing worldwide. “We’re running out of drugs to throw at the bugs,” says Spellberg. So how do we fix this? Spellberg, like many public health officials, advocates for the elimination of inappropriate antibiotic use. But that isn’t something only doctors need to monitor. While some physicians may be over-prescribing antibiotics, the pressure to do so is often coming from patients. Ineffectual antibiotic prescriptions for viral infections should stop, says Arias. He also points out that in many developing countries a prescription isn’t required for antibiotics–another place where inappropriate antibiotic use can be bridled. Inappropriate and ineffectual antibiotic use is also rampant in livestock husbandry. For decades, healthy animals have been fed antibiotics as prophylaxis against infections and because they promote growth. “It’s a national disgrace that we still use antibiotics for growth promotional purposes,” says Spellberg. To reduce antibiotic exposure in the environment–and the associated emergence of resistance-antibiotic usage should be cut back in animals even more than in humans, he says. Eighty percent of all antibiotics in the United States are given to livestock, effectively breeding antibiotic-resistant bacteria into the food we eat, says Spellberg. According to the CDC, the United States has 9.4 million cases of food-borne illness every year. Yet rather than curb the use of antibiotics on farms, the industry focuses on developing new disinfecting technologies. In the meantime, a good start would be to ease up on the approval process for new antibiotics and prohibit the mass administration of antibiotics to healthy livestock. These measures would help stem the coming wave of superbugs. As for new treatment options, there’s phage therapy. It’s a treatment that involves engineering naturally occurring viruses that prey on bacteria–called bacteriophages–to attack superbugs. It’s an under-researched idea that sounds like science fiction, but it’s a promising area of medicine. After all, if we’re running out of antibiotics, why not just give the bug the flu? Aleszu Bajak is a science writer and a producer for NPR’s “Science Friday.” He also writes the Spanish language science blog Ciencia Cierta and plays in a bluegrass band.